I think it's time to announce it. Josh and I are yuppies. No, that is too drastic. Let's say we're on our way to becoming yuppies. I liked how Urban Dictionarysays yuppies "usually congregate in Starbuck's, Whole Foods, Trader Joe's, and a wide variety of vintage clothing boutiques." Dang. We go to all those places except the vintage clothing boutiques. So, 75% yuppie maybe? What makes me think we're on the edge now? 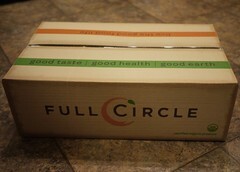 The fact that we just join a produce delivery service, Full Circle. This service brings fruits and veggies from local farms to your door (or drop off place). This means you get fresh, organic goodness every week. Our first order was supposed to come on Friday; however, you may have heard on the news or by reading my blog that we had a tiny storm here. That basically stopped everything. Instead our order arrived Saturday. 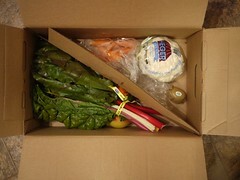 As you can see, we received carrots, cauliflower, oranges, chard, kiwis, pears, and apples. Some of it's hiding in the photo under the leaves of the chard. I made the chard last night. This was my first time using it. A friend told me what to do since I didn't feel like scouring the web for recipes. I basically tore the leaves off and chopped them. Then I chopped the steams alongside some leeks. I put some butter and olive oil in a plan and sautéed the leeks and stems. Then, once they softened, I added the leaves. Add in a pinch of salt, pepper, and some crushed garlic. Voila, a veggie side.